Common Questions – What’s Involved in Registering a US Trademark? How Valuable is a Good Trademark? The value of a good trademark lies in its ability to convey to the public the source of a particular good or service. The key is to develop a mark unique enough that customers associate it with your goods or services – and only your goods and services. While temptingly simple, choosing a mark that describes your goods and services will not create any trademark value. Customers won’t know to distinguish your goods from others in the same market. Can Rights Develop Based on Use? Federal registration is not a requirement to protect trademarks in the U.S. – instead, rights in a particular trademark can be established simply based on use in connection with particular goods or services in the marketplace (aka “common law trademark rights”). Nevertheless, federal registration offers more comprehensive protection than reliance upon common law rights, including providing nationwide notice of the owner’s claim to the mark. Is Pre-Application Searching Required? No, it’s not required, but it’s a good idea for a variety of reasons. See my prior post on Common Questions – Benefits of Trademark Searching for more details. Overview of the Application Process. The chart below gives a birds-eye view of each application track (Use-Based vs. Intent to Use-Based; both are described below). One of the first steps in registering a proposed trademarks or service mark is to determine exactly how you are using (or intend to use) a mark and then to determine the applicable class or classes in which the mark should be registered. An applicant may elect to apply for registration in all of the applicable classes in its first application, or apply for the core classes and wait until later to file in other applicable classes. There are current 45 potential classes (see Nice Classifications) – each one triggering a separate filing fee (see Current Filing Fees). When you file an application to register a trademark based on a particular description of goods or services (regardless of which classes you designate), you may later clarify or limit the goods or services offered in connection with that mark – but not expand or broaden them or change the way the mark looks on the drawing page submitted to the PTO. Accordingly, it is critical to work out with your trademark lawyer the ways in which you already use the mark, or plan to use the mark, before the application is filed. Every application must include a clear drawing of the mark that you want to register. This drawing is used by the PTO to file the mark in the PTO’s search records and to print the mark in the Official Gazette and on the registration certificate. The representation of the mark must, therefore, appear in the proper format for either a word mark or a design mark (there are several variations). If a particular design or style of lettering is embodied in the mark, the drawing must be a substantially exact representation of the mark as it appears on the specimen. Color may also be a key feature of the mark – if so, it should be claimed in the application. If you have already started using the mark in commerce in connection with the subject goods or services, the application is said to be based on “use.” If no such use has yet been made, but you have a bona fide intent to use the mark in connection with particular goods or services, the application is an “intent to use” one. For a use-based application, you must submit a specimen at the time of the application that shows how the mark is actually used in commerce. This is not the same as the drawing of the mark included on the drawing page. Picking the right specimen is an art. You can find more information in the PTO’s guidance materials (TMEP § 904 (Specimens), § 1301.04 (Specimens of Use for Service Marks); Trademark Basics), but you should also consult with your trademark attorney about the best specimen to use. If the application is based on a bona fide intent to use the mark, you will have to submit an Amendment to Allege Use or a Statement of Use (the choice depends on the timing of filing – and depends on whether the PTO has already issued a “Notice of Allowance” after the opposition period has ended) after you start to use the mark – to demonstrate actual use and to identify the “date of first use.” The PTO charges an additional filing fee (Current Filing Fees) for either of these two filings. After the PTO receives your application, an Examining Attorney will review it on a substantive basis – to determine if it can be approved for registration. This may take several months, and may require several interactions with the PTO before this phase can be completed. If the Examining Attorney finds fault with the application for any reason, the Examining Attorney will issue a letter (“Office Action“) explaining any substantive reasons for refusal and any technical or procedural deficiencies in the application. If only minor corrections are required, the Examining Attorney may contact you or your attorney by telephone or e-mail. If the Examining Attorney sends a formal Office Action, your response must be received by the PTO within six months or the application will be deemed abandoned. ornamental, or for other similar reasons. It is impossible to accurately predict how an Examining Attorney will view each application, but completing some version of a commercial search in advance can give you a “heads up” about potential conflicts before you file. If the Examining Attorney raises no objections to registration, or if you are able to overcome all objections, the Examining Attorney will approve the mark for publication in the Official Gazette, a weekly publication of the PTO. The PTO will send a “Notice of Publication” to you (or your attorney) identifying the “publication date”. Any party who believes it may be damaged by registration of the mark has thirty days from the publication date to file either an Opposition to registration or a request an extension of time to oppose. If the mark is published based upon the actual use of the mark in commerce and no party files an opposition or request to extend the time to oppose, the PTO will normally register the mark and issue a registration certificate within several months after the mark was published. It is not unusual for this entire process to take between 1-2 years to complete before the Certificate of Registration is issued. If the mark is published based on an “intent to use” the mark, then the PTO will issue a “Notice of Allowance“, upon which you must file evidence of your use of the mark (“Statement of Use“) within the initial six months (or during permitted extensions of time to file), demonstrating that use has occurred. Registration will issue in due course after the PTO accepts your filing as meeting its requirements. Anyone who claims rights in a service mark or trademark may use the SM (in the case of a service mark) or TM (in the case of a trademark) designation with the mark to alert the public that the mark owner claims exclusive rights. It is not necessary to have a registration, or even a pending application, to use this designation. Although the claim to the mark may be disputed later or you may find someone else has a more senior use and requires you to stop using this designation, the use of the SM or TM may, nonetheless, be used with the mark in advance of any such determination. The registration symbol, ® , (also called a “Circle-R”) may not be used until the PTO has issued a Certificate of Registration for the mark. Certainly, a ® should not appear next to the mark in the specimen that you submit to the PTO with your initial application or Statement of Use, or the PTO will reject it. In all cases, the mark should be used consistently in all classes covered by the application so that it can continue to develop significance as a “source indicator” in the classes in which you use it in commerce. Attorney fees will differ from firm to firm, and (actually) from application to application because there are so many moving parts. It is therefore impossible to predict with any certainty how much an application will cost from start to finish. Request for Extension of Time To Allege Use – $150 per class of goods/services. 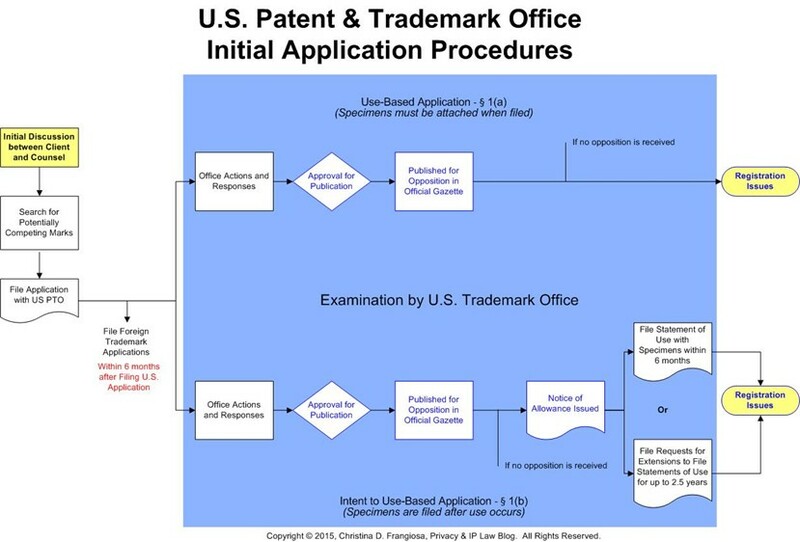 Trademark Basics: “Basic Facts About Trademarks: What Every Small Business Should Know Now, Not Later” – includes videos, Basic Facts booklets, timelines showing the process for applications, etc. Trademark Process: Step-by-Step evaluation of whether filing a trademark application is right for you. TEAS Nuts and Bolts Videos: Explains various stages of the application process. Of course, if you have any specific questions, consult with your trademark attorney to see what options are best for you. Posted in: Common Law Marks, Common Questions, Geographically (Mis)Descriptive, Likelihood of Confusion, Opposition, Requirement of Use, Trademarks	| Tagged: Copyright (c) 2015 by Christina D. Frangiosa All Rights Reserved.